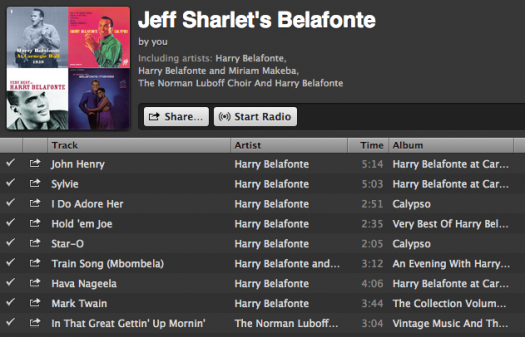 Today’s post by Jeff Sharlet offers a companion playlist to his piece “Voice and Hammer,” a profile of Harry Belafonte. Click here to view and listen. I like stories that allow me to linger, to circle back, to return to a set of words, an image, a song I can’t get out of my mind. In writing “Voice and Hammer,” it was the 1959 broadcast of Tonight With Belafonte, and the chain-gang songs with which Belafonte declared himself more than just the “King of Calypso.” The first song on my playlist, “Rocks and Gravel,” is from a related album Belafonte released in 1960, Swing Dat Hammer. It’s a work song and, in a way, freedom song, which makes it a good writing song. The following two songs, “John Henry” and “Sylvie,” are from Belafonte’s brilliant 1960 live album, Harry Belafonte At Carnegie Hall. The soft irony of “Sylvie” prepares you to hear the gentleness of Belafonte’s Caribbean-inflected songs freed from the layers of camp with which pop-music history has glazed them. “I Do Adore Her,” by the Brooklyn-Barbadian songwriter Lord Burgess, is my favorite. I include “Hold ’Em Joe” so you’ll get the code. You can find “Day-O” on your own, but here’s the nighttime version, “Star-O,” from the same album. “Train Song (Mbombela)” is a duet with the South African vocalist and antiapartheid activist Miriam Makeba, who became one of the first African global superstars after Belafonte helped her gain entry to the US in 1960. Together they won a Grammy for their 1966 album, An Evening with Belafonte/Makeba. “Mark Twain,” the first track on his 1954 album of the same name, is sometimes incorrectly credited as his first recording. It was the debut of a liberated Belafonte, singing the songs he’d chosen for himself the way he wanted to sing them. A couple of years before he hit his best-selling groove, you hear the whole Belafonte to come—the humor, the ham, the earnestness, the soul. It’s soul you hear most in Belafonte’s devastating rendition of “Take My Mother Home,” a heartbreaking nineteenth-century spiritual included on his second studio album, Belafonte. At first, you might think it’s about Jesus. Keep listening. The next track, “Follow the Drinking Gourd,” is sung by Leon Bibb, the blacklisted folksinger who shared the stage with Belafonte and Mary Travers. Fugitive slaves would use the Big Dipper, or the Drinking Gourd, to navigate north. In 1962, Belafonte asked Bibb to sing this version of the song, which may have been used by slaves as a kind of map, for Belafonte’s massive anthology of black music, recorded over ten years, called The Long Road to Freedom. It wouldn’t be heard for decades, and then it had the misfortune of being released on September 11, 2001. The only place online that you can hear Bibb’s version, considered the closest to the original song, is at this fascinating page dedicated to the cultural history of “Follow the Drinking Gourd.” It’s the first link. Last, the song with which Belafonte closed his 1959 TV special: “In That Great Gettin’ Up Mornin’,” a gospel song he and the Norman Luboff Choir sing here as a freedom song. Play it loud to hear both the anger and the joy.